Prepare a grill for high-heat cooking. Brush tomatoes, corn, green onions and jalapeño on all sides with oil. Place the vegetables on the grill and cook, turning them frequently and removing them as they become soft and charred, about 5 minutes for green onions and jalapeño and 7 to 8 minutes for corn and tomatoes. Transfer to a cutting board. Meanwhile, sprinkle steaks on all sides with 3/4 teaspoon of the salt and black pepper. Place steaks on the grill and cook 3 minutes; rotate each steak about 90 degrees (this will give you nice grill marks) and cook 3 more minutes. Flip steaks and repeat grilling and rotating process, cooking until steaks reach desired doneness, about 5 minutes more for medium-rare (145°F internal temperature). Transfer steaks to plates and let rest 5 minutes. To make the salsa: Remove skin from tomatoes and dice the flesh; place in a large bowl. Cut kernels from corn ears and add kernels to the bowl. Slice green onions and add to the bowl. Split jalapeño and remove seeds and stem; finely chop flesh and add half of it to the bowl. Toss salsa with lime juice and remaining 1/4 teaspoon salt. Taste the salsa; if you would like it spicier, add the remaining jalapeño. 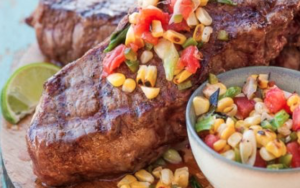 Serve salsa with steaks. Per Serving: 490 calories (180 from fat), 20g total fat, 7g saturated fat, 175mg cholesterol, 620mgsodium, 14g carbohydrates, (2 g dietary fiber, 5g sugar), 62g protein.